The Alps form an important divide for Western Europe. The Rhine, although it its the only river from these regions to flow to the North Sea, drains away 70 per cent of the Swiss water. The Rhône –preferring sunnier regions, and flowing into the Mediterranean – drains 18 per cent. The rest is drained by the Ticino rivers, which flow into the Po, and by the River Inn, which rises in Grisons Canton, flows eastward, and joins the Danube. Heavy precipitation in the high mountains and on the great glaciers provides Switzerland with ample water resources. It is always a moving experience to see the modest source of a great river. A mountain rivulet bubbles out beneath the terminal moraine of a glacier, trickling peacefully between the bizarre shapes of erratic boulders. its cold water is milky with sand and mud. Bowing to the irresistible force of gravity, it flows downwards towards the plains. But there are numerous obstacles on the way, and the glacial stream’s journey turns into a breathtaking adventure. At times the water course drops abruptly, forming a waterfall, which is particularly impressive in April, when the snow is melting, or in July and August, when the summer thunderstorms echo round the mountains. The water, loaded with sand and stones, cuts into hard rock, forming deep, narrow gorges. Gradually the stream grows into a torrent, thundering and seething downwards, throwing up a fin spray in which the sun forms wonderful miniature rainbows. The erosive power depends, of course, on the amount of water and the speed at which it travels. Further down the valley, the gradient slowly flattens out, but the River’s erosive power is kept fairly by the acquisition of fresh water from small tributaries. The gorges from an unusual, fascinating, and impressive world, bearing witness to the power of water, and constituting one of the main attractions of the Alpine regions. Rivers often have tributaries very near their source. These frequently originate in funnel-shaped basins which open to the skies to receive the rain or snow falling on the mountains. These streams down the slopes, cutting channels through accumulations of debris. Down in the lower reaches, they join the river, adding to its load of sand, pebbles, and fragments of vegetation. 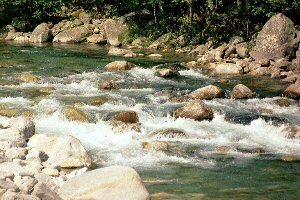 Mountain people have long had a healthy respect for the temperamental and unruly mountain streams whose flow can vary abruptly and unexpectedly. A rainstorm in the high mountains can lead to a dangerous increase in the flow of water. Earthslides and floods can be extremely destructive, destroying woodland, crops, barns, and houses. Now, as the flat country opens out in front of it, the river can begin to relax. The rate of flow decreases, and it meanders along, nibbling at the banks, especially high water periods; an action which can have tragic consequences for the population. Dikes and course corrections prove inevitable. They provide effective protection against floods for the fields and villages. These measures are supplemented by re-afforestation of the most exposed slopes, partly with a view to preventing disastrous earth slides. When the river is finally clear of the mountains it may flow into a lake, emerging again at the other end to continue its journey. It gets further and further away from its origins, flows across borders, and becomes an international waterway. By the time it finally flows into the sea it has achieved more than local fame. The Swiss are proud of their country’s lakes, which, not surprisingly, feature in every travel guide. There are hundreds of them in the Alps, filling glacial basins, or valleys blocked by moraines. Even the tiny ones add a touch of variety to what might otherwise be a somewhat monotonous: they act like mirrors, doubling the beauty of the trees and mountain peaks. Lakes at lower altitudes can take on impressive proportions. They have frequently been major factors in the history of their regions. The mountain lake owe their wonderful colours to the depth of their waters, the climate, and the vegetation growing round their shores. They regulate the water of the outlawing rivers. The lager the mass of water, the smaller the fluctuations in level. The large lakes also have another advantage: they have a moderating effect on the climate, storing heat in summer and releasing it again in winter. This encourages the growth of numerous forms of vegetation which would otherwise not be able to survive here.